We have been signed as the official online media partner for the upcoming WordCamp Europe 2019. And since we are the official media partner for the event, we will be providing you with the news related to WCEU and keep you updated on the latest development process. WordCamps are locally-organized, annual conferences that cover everything related to WordPress. It brings together WordPress community members from all over the world at a commonplace. It provides a chance to gather in a new location to share insights and experiences, do business, make connections and talk about WordPress. Matt Mullenweg, the co-founder of WordPress initiated the first WordCamp in 2006 in San Francisco. And since then various local communities have organized their own WordCamps. The frequency of WordCamps around the world has been steadily increasing each year since then. WordCamp Europe 2019 is happening in the beautiful city of Berlin. It is going to take place on June 20-22, 2019, at Estrel Hotel and Congress Center in Berlin, Germany. If you want to experience three days full of WordPress nerdery, we suggest you book your seats for the event. We’re extremely proud that we’ve been given the opportunity to be a part of this wonderful event as the official online media partner. 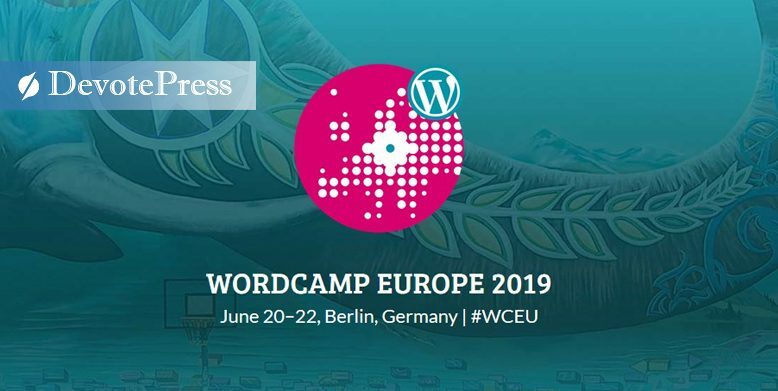 The whole team of DevotePress will be on our toes to bring you all the latest news and developments in the process regarding WordCamp Europe 2019. Know more about the WordCamp Europe 2019 event here. Subscribe to DevotePress, like us on Facebook and follow us on Twitter to keep yourself updated with WCEU2019.